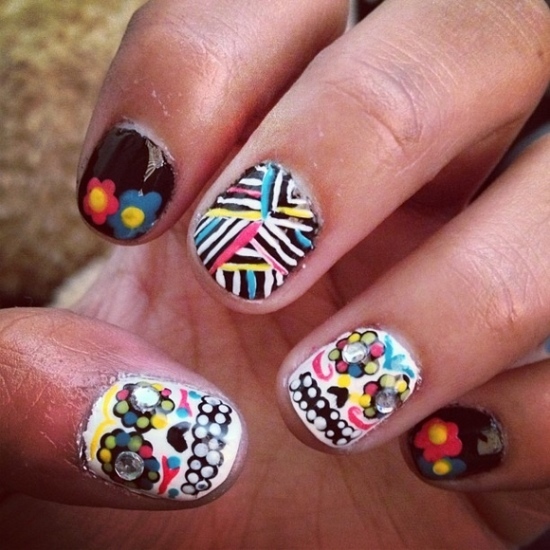 Nail art designs have become much more bold and experimental for a long time now and oh how much do women love experimenting! 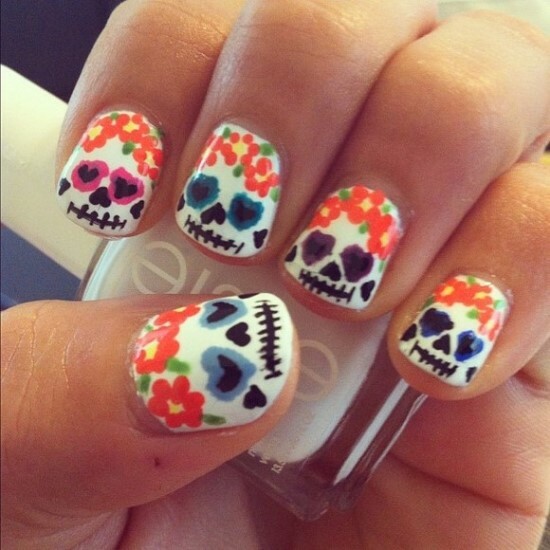 Painting the nails was once a very simple process, applying a nail paint color onto your nails of your choice. 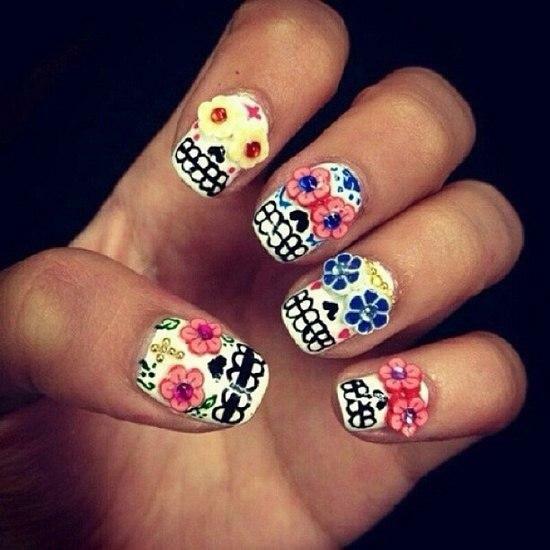 Today, women indulge themselves in creating various unique and enthralling designs that make them appear quite attractive. Such designs also make the nails a focal point and a great accessory for women. 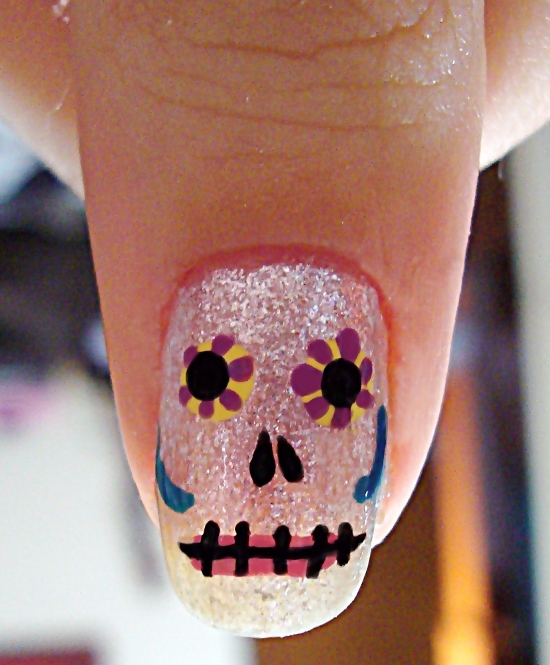 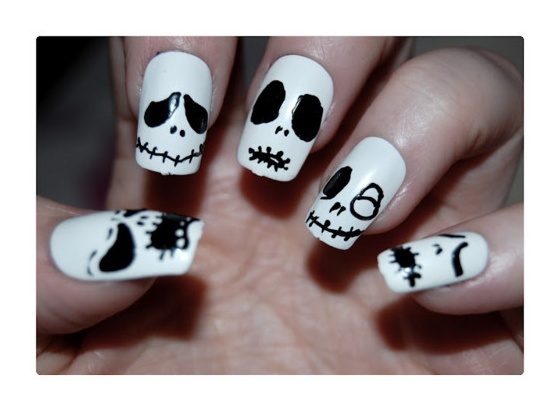 Skull nails are one such nail design that has become quite popular amongst women. 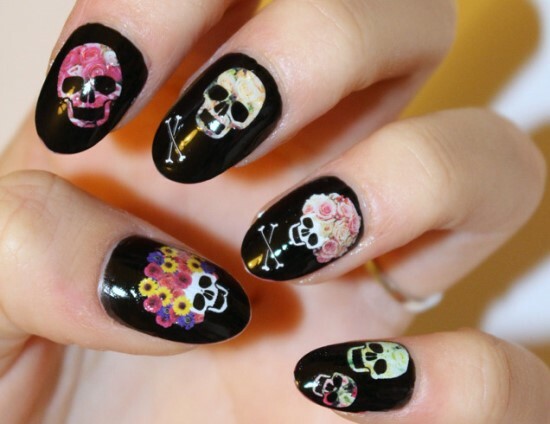 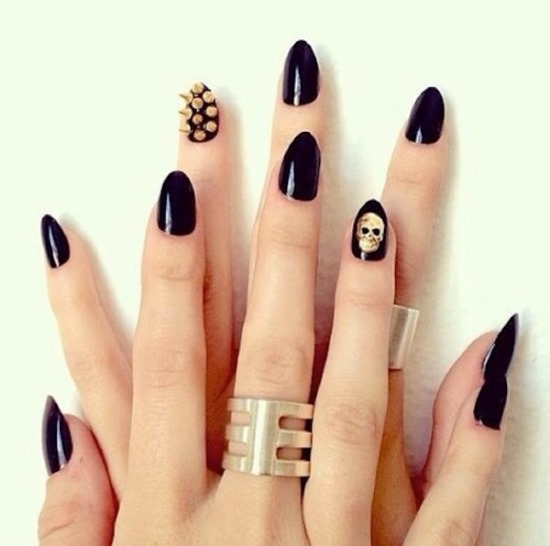 From teenage girls to grown-up women, all wear the skulls quite attractively on their nails. 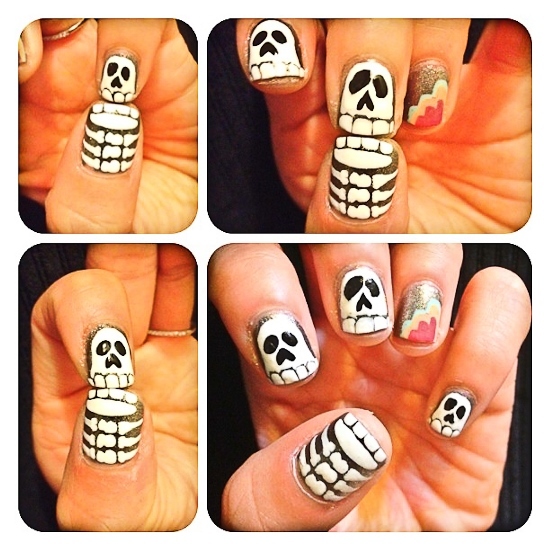 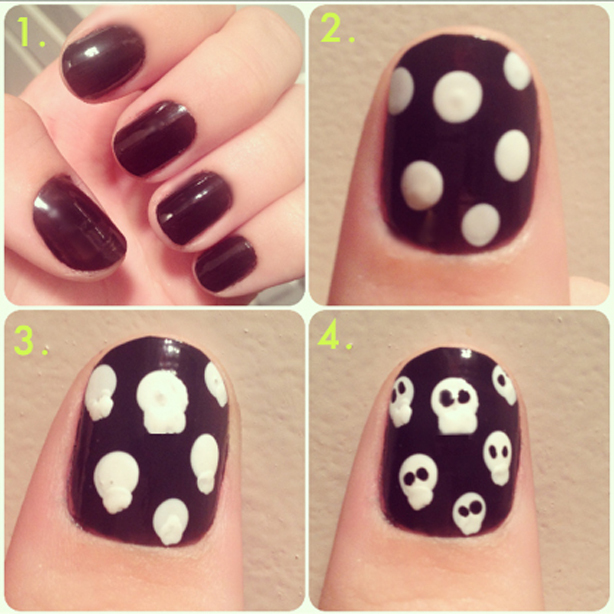 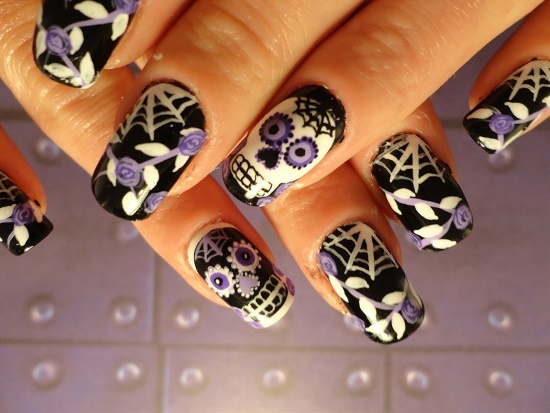 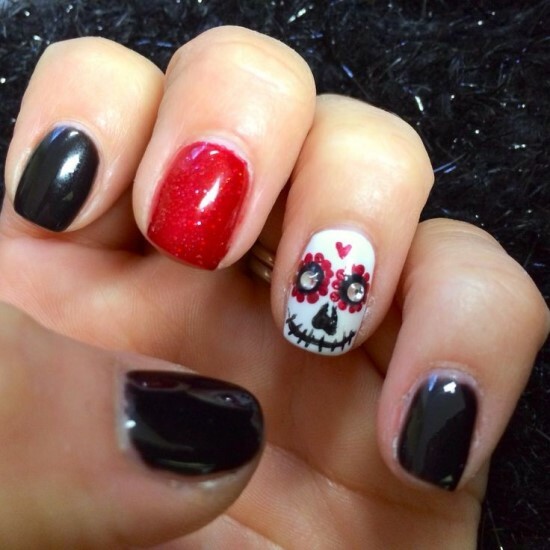 Skull nail art is generally a favorite during the Halloween season. 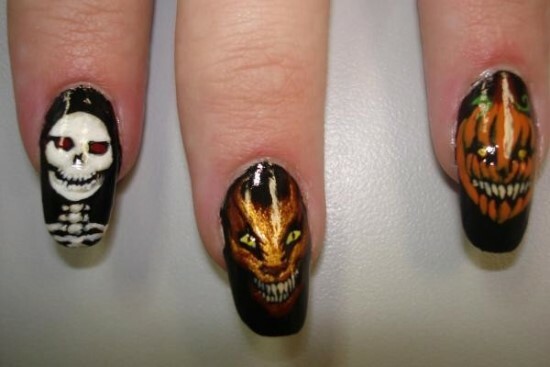 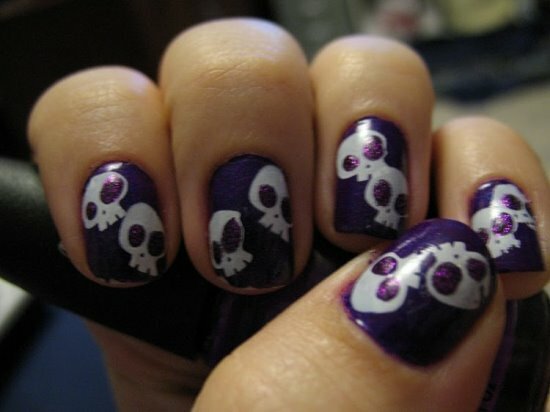 It is generally popular amongst teenage girls, who like to experiment with their nail art techniques but are also worn by women at Halloween parties or such occasions. 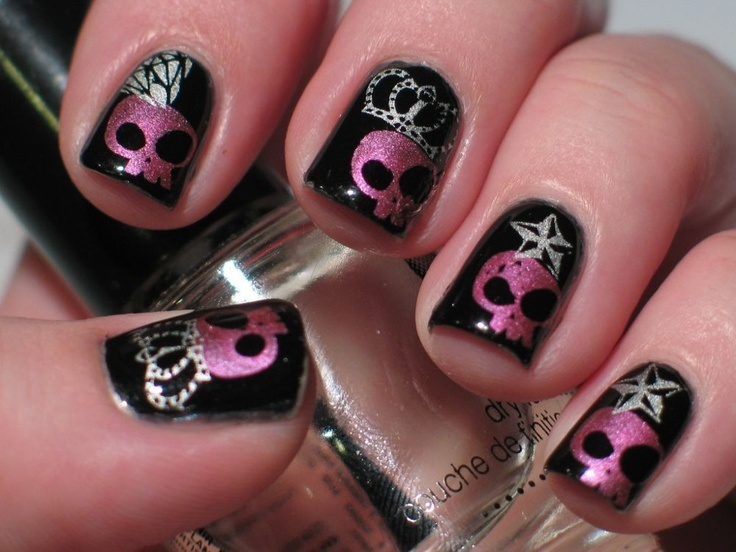 However, if you simply want to bring out your inner punk self out then skull nail art designs are probably the best. 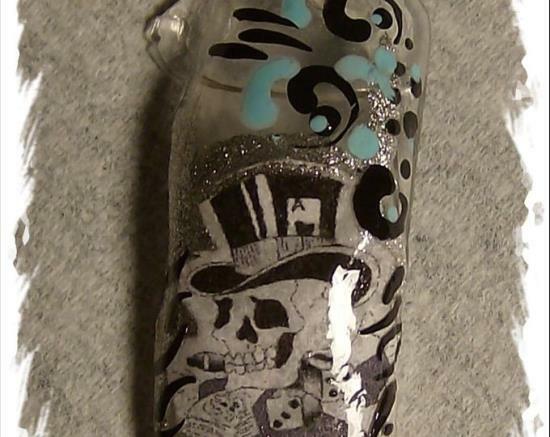 Skull designs can be done in varied ways and with a wide range of colors. 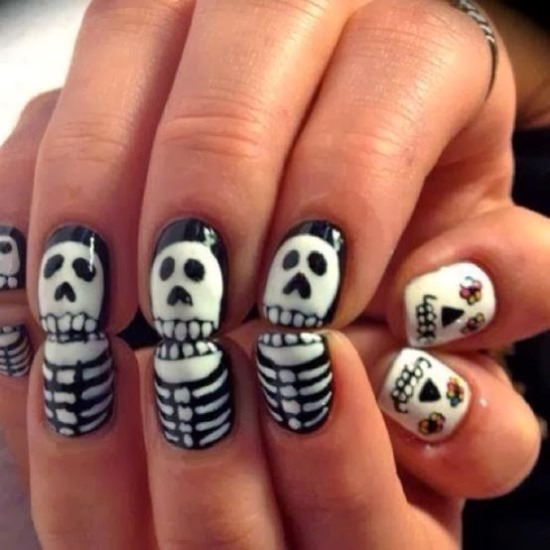 You can have a collection of small skulls on your nails or have a skull each on your nails. 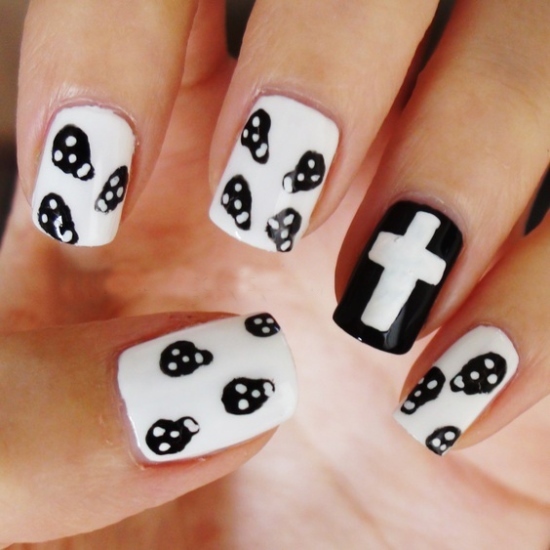 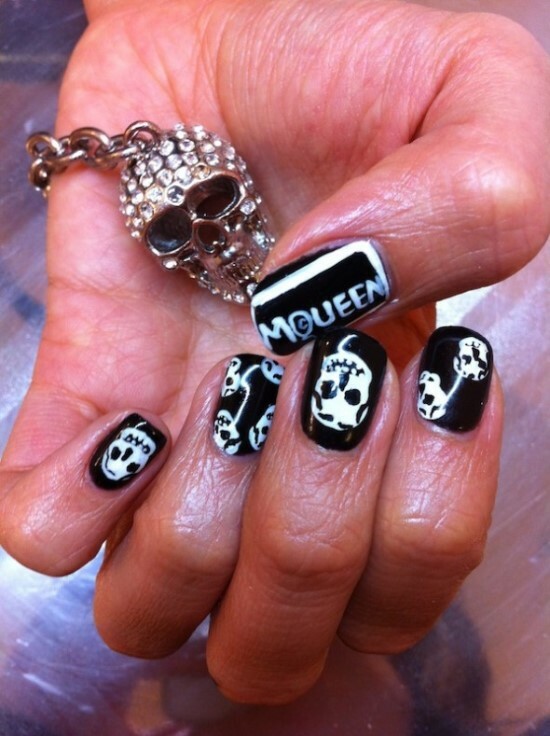 You can have a monochrome theme for your nails or choose any colors to conjure those beautiful skull nails. 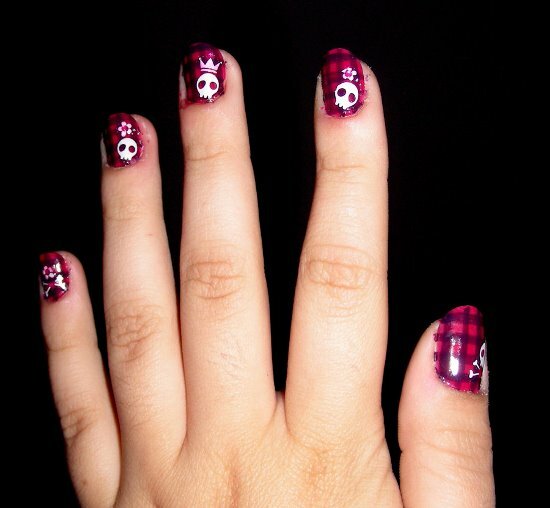 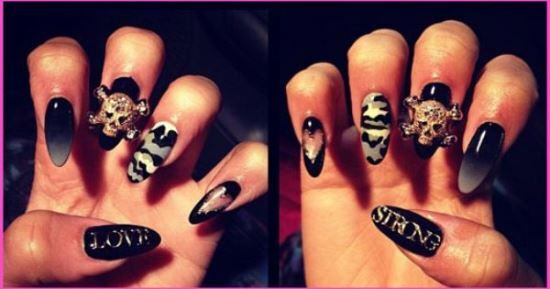 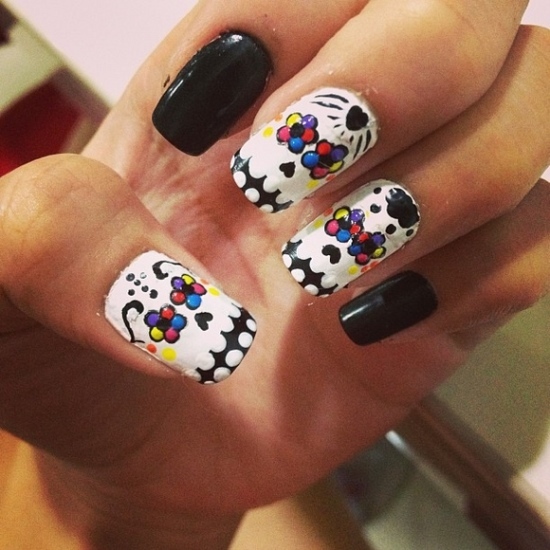 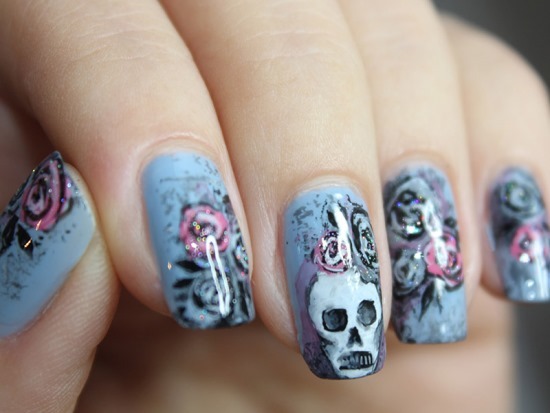 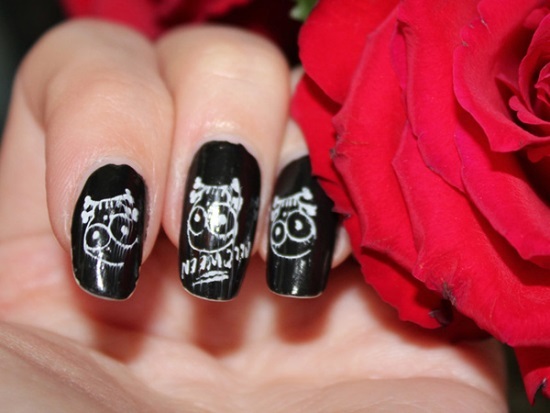 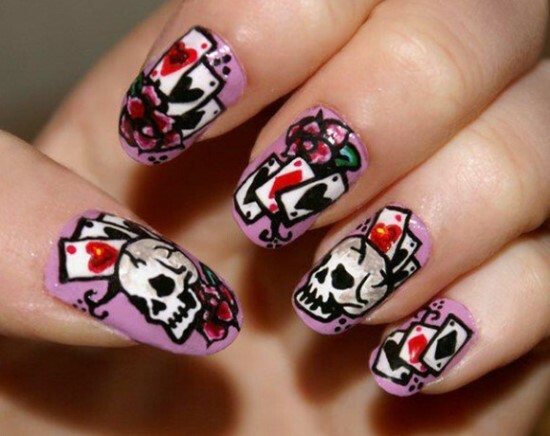 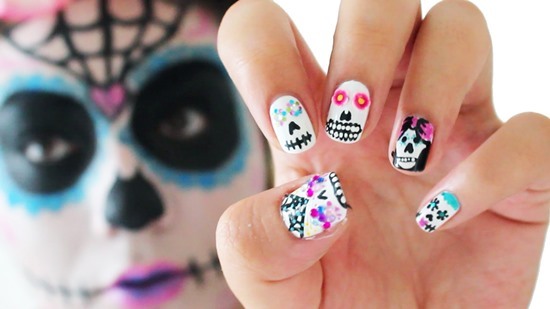 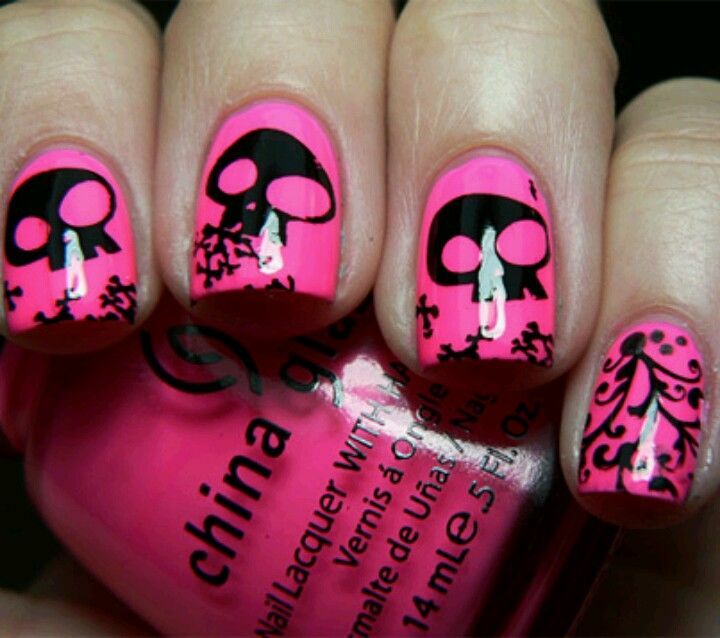 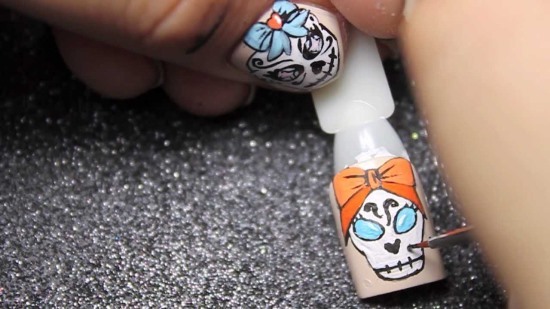 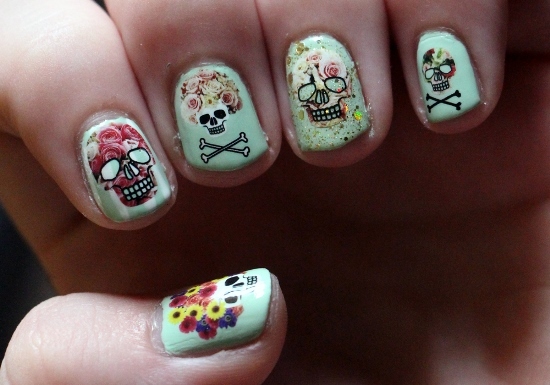 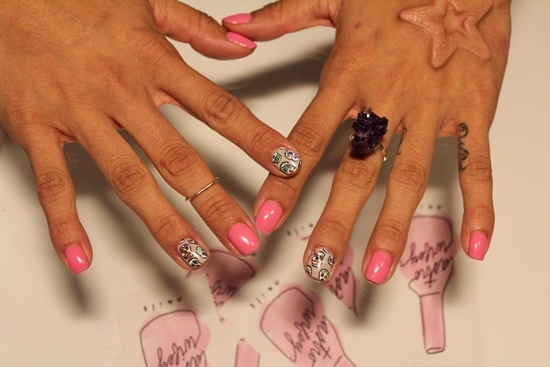 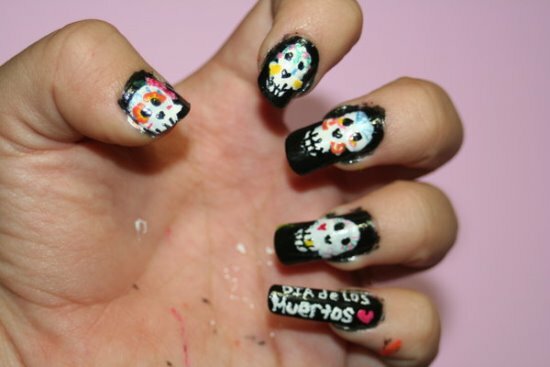 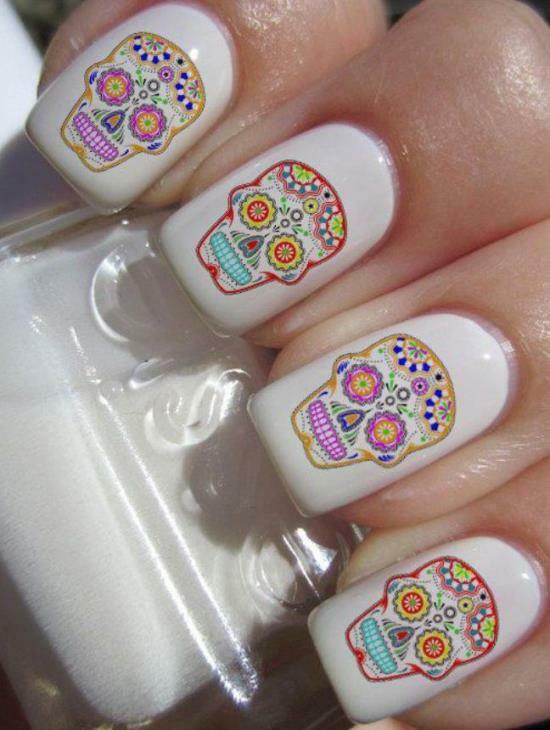 You can also mix designs on your nails along with the skull design ideas. 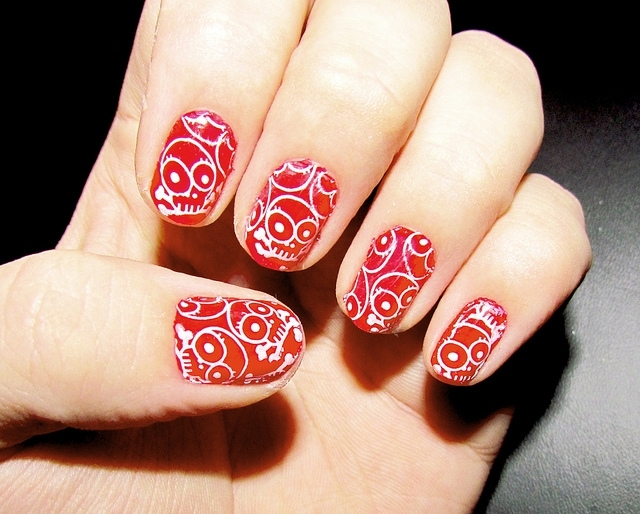 You can have geometrical patterns paired up with your skull designs. 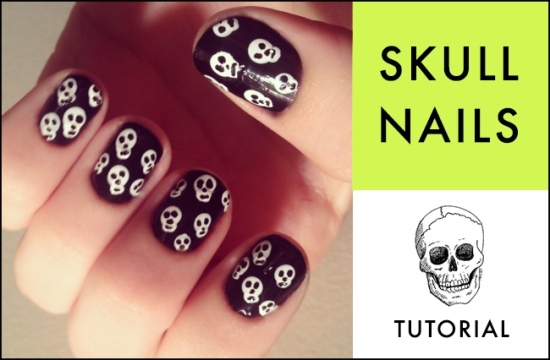 You can also choose to have a single skull on two or three of your nails while have several on the remaining of your nails. 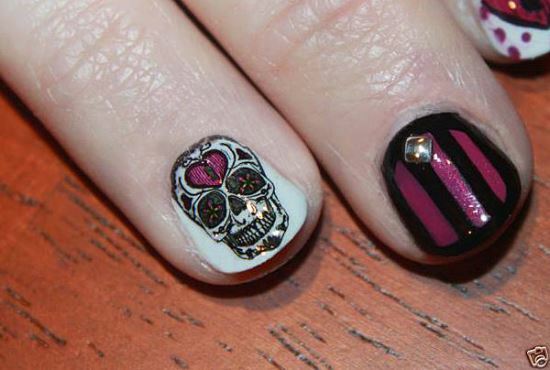 You can also choose a dual color scheme, say pink-black or purple-white for your skull nail art designs. 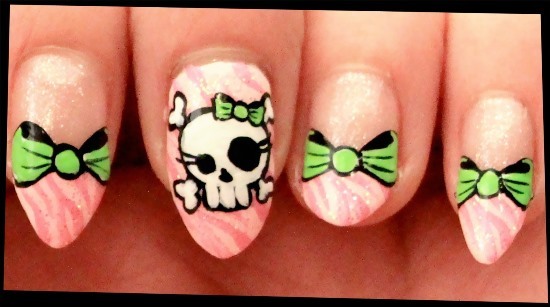 For a more girly look, you can opt for a skull with bow design on your nails. 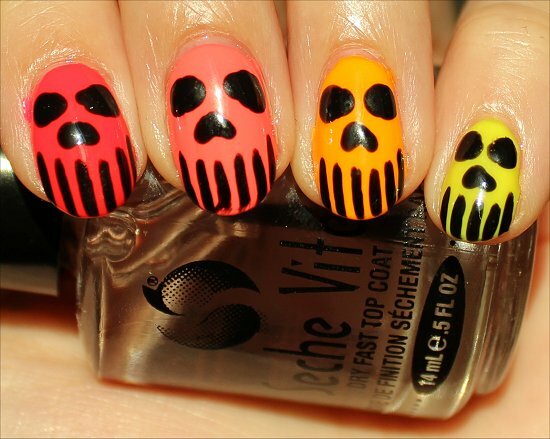 Again, any color combination can be chosen for the nails. 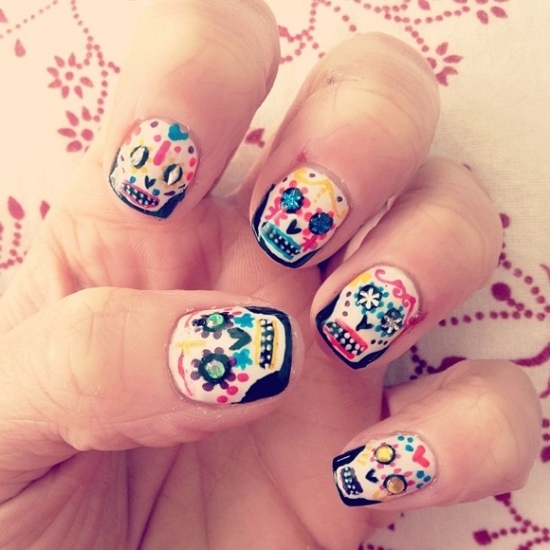 Sugar skull nails are also quite popular amongst girls. 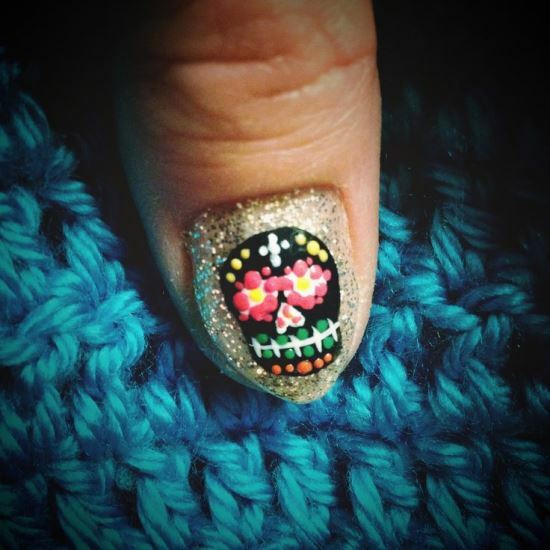 Generally, sugar skulls are symbolic for the loved ones who have passed away, but are often times used as merely an attractive image. 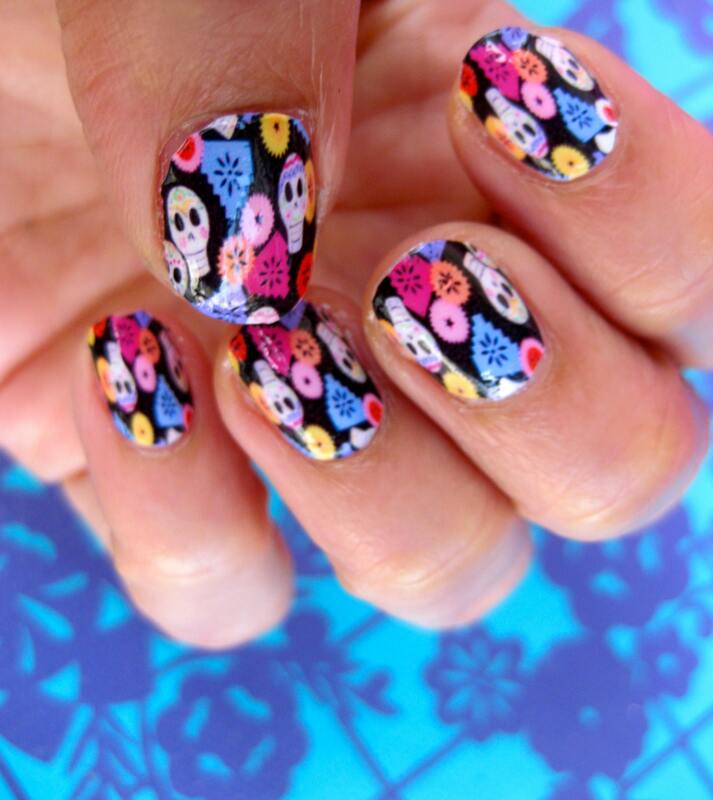 There are intricate details in sugar skulls which are quite difficult to replicate on the nails, but women still love to go for it. 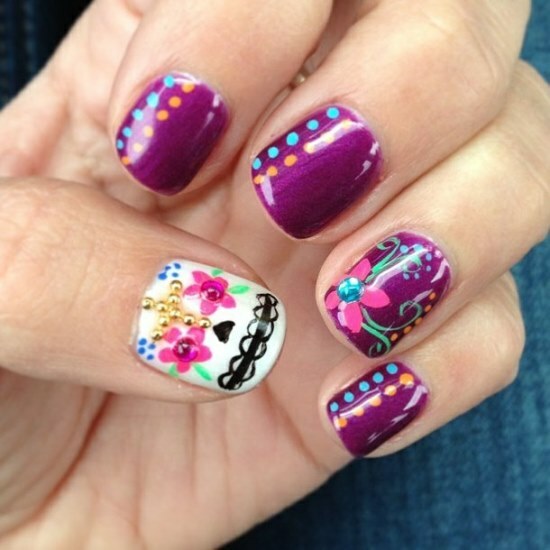 Each sugar skull has a different and unique pattern to it and they have a visual appeal and attraction of their own. 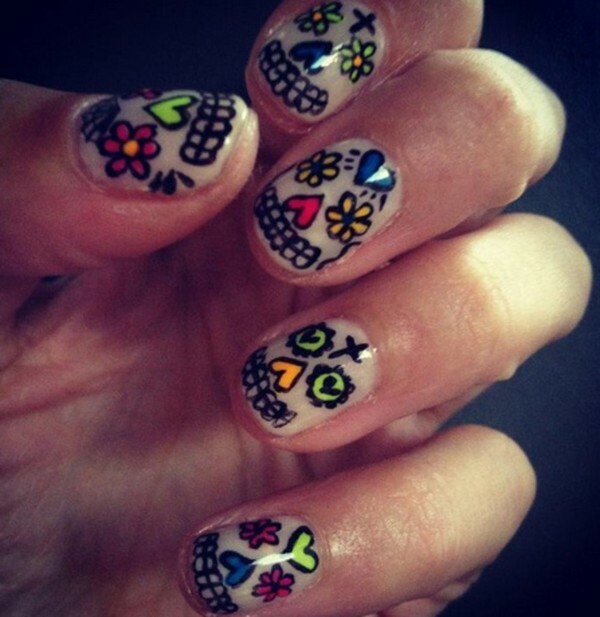 You can use your nail art tools to create the intricate patterns to create your unique sugar skull nails. 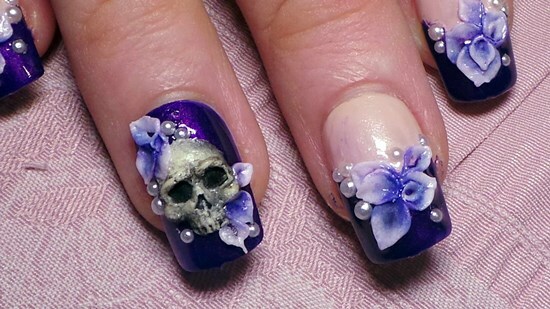 Skull nails are always a unique way of grabbing attention. Use your wild imagination while you’re at it, to produce the most unique and attractive nail designs. You can always conjure up the designs in accordance to the event you’re attending, say a Halloween party or a night out with friends. 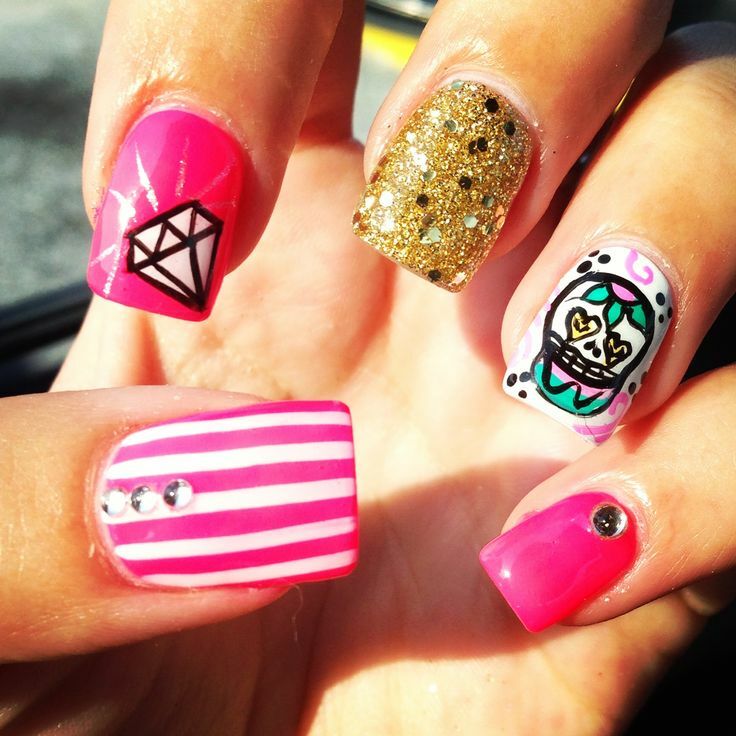 Options and designs are many from which you can choose and even improvise for your nails. 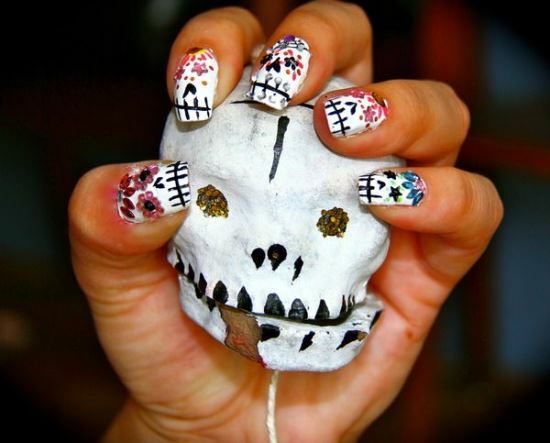 We here, have gathered some 50 rocking skull nail art ideas for you to choose from and use them on your nails.